I grew up in Hawaii where sushi in my family usually meant something like a California roll. We ate sashimi as well, but I’d not had nigiri, or at least really good nigiri, until coming to San Jose. Our friends introduced us to some awesome sushi at Sushi Masa in south San Jose, and we were ruined forever. Now, Annie and I are very discriminating sushi lovers. Searching around on the Internet, I found out about Akane Sushi restaurant on the “Big List of Peninsula Sushi” http://www.emeraldlake.com/sushilist.html . It was #2 on the list because of the high quality fish at a great value. So when the opportunity arose, I suggested we head out to Los Altos and see for ourselves. Back in Honolulu, Annie and I used to go produce shopping almost every Saturday morning in Chinatown. By lunchtime we were famished. If we didn’t have other plans, we’d often stop in at Mei Sum on Pauahi and Smith Streets. You could get pretty good quality dim sum at a more reasonable price than the fancier places like Legend in the Chinese Cultural Plaza. Nowadays, dim sum is more of a “once in a blue moon” deal. There are some good places to eat in Milpitas and Cupertino, not to mention faraway restaurants like Koi Palace in Daly City. We’ve tried out other dim sum places (Hong Kong Saigon in Sunnyvale and East Ocean in Alameda) but our go-to dim sum restaurant of choice is Dynasty on Story and McLaughlin right here in San Jose. I love Korean food. Growing up in Hawaii, we had our favorite Korean restaurants (Gina’s comes to mind) to get our fix of meat jun, bbq chicken, and kal bi. Here in the Bay Area, there is a high concentration of Korean restaurants in the Sunnyvale / Santa Clara area. Too many to try all by ourselves, so we asked some of our Korean friends to recommend a place to go for lunch. They recommended Secret Garden Korean Restaurant. It’s in a little strip mall in Sunnyvale on El Camino Real near Lawrence Expressway, across from the Starving Musician shop. When we arrived at 12:30, there wasn’t much of a crowd and we were seated right away. Typical of Korean restaurants, they loaded our table up with pan chan (side dishes). 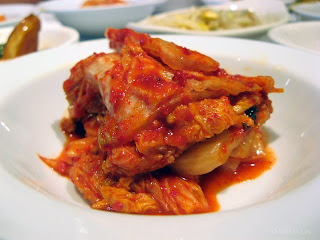 Here is the won bok kim chee. This wasn’t sharp or overly salty like others I’ve had. It’s definitely been fermenting for a while – the won bok cabbage is quite soft. I also liked their daikon kim chee. 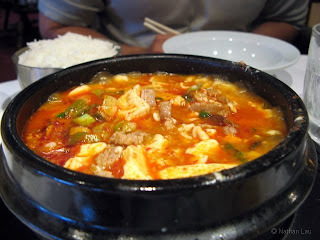 Annie ordered the Soon Dubu Jigae, a tofu hot pot. It comes to the table boiling hot. There’s pieces of pork mixed in with the soft tofu and green onions. The dish was really wonderful – I loved the bonito flavor in the broth. It wasn’t too light or too heavy – just perfectly balanced. I got a bi bim naeng myun. 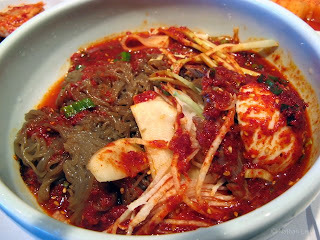 Thin, chewy buckwheat noodles (different from Japanese soba-style noodles) served cold and mixed with julienned slices of radish and cucumber, thin slices of Korean pear, a couple of slices of beef, and half a boiled egg, swimming in a sweet and tangy Korean chili sauce. It’s not as spicy as it looks, though I did start to sweat a little. I almost didn’t want to let Annie have some of my dish. This was the best Korean food I’ve had in a while and, while the prices are slightly higher than what we’re used to, the quality and flavor are worth coming back for. 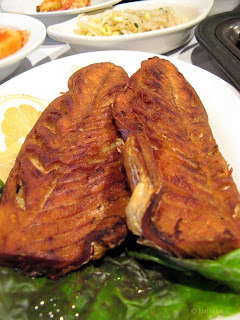 Any favorite Korean restaurants in your neighborhood? 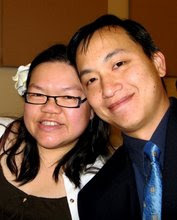 We went to Pho Y #1 Restaurant on Capitol Expressway near Silver Creek Rd in South San Jose for dinner one night. It’s supposedly the best place for pho in San Jose. But in a city with the highest concentration of Vietnamese outside of Vietnam, that’s a bold statement to make and a hard reputation to maintain. 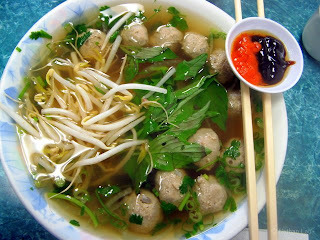 I wasn’t feeling like all those assorted beef cuts you usually get in pho, so I just ordered mine with beef meatballs. It’s not bad, but I don’t think it’s the best pho. The broth here is nothing special – it doesn’t make me go “ahhhhh” when I take that first sip. The broth over at Beef Noodle #1 across the way is better, IMO. Where is your favorite place for pho? SWIFT Theme by Satish Gandham. 51 queries in 0.736 seconds.